Need more ideas for using alcohol inks in your stamping? 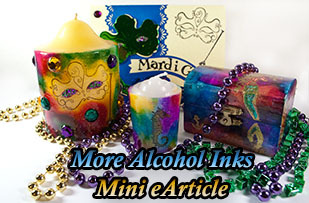 This online mini eArticle adds to VSN’s Jun ’11 issue (out of print) feature article on how to use alcohol inks on surfaces other than paper. It adds more ideas for using alcohol inks (both bottled ink and markers) on a wood box and candles. Questions About How eArticles work? See the eArticle FAQs page. 5 half-sized pages designed to view comfortably on your computer screen. By clicking arrows underneath the three dimensional artwork in the eArticle, you can turn it to see all sides! NOTE: Because of the artwork that turns, this eArticle really needs to be opened using Adobe Acrobat viewer. If you have rotated a picture on a previous page and get an echo of it when you go to the next page, refresh the page to clear it.